Two hours until dinner and I have a ‘to-do’ list as long as my arm I need to get done. WHY do I always leave dinner hanging over my head? (I really keep meaning to do meal planning but it never happens!) I need something quick and healthy that the kids will actually eat. Who am I kidding? I have aubergines, courgettes and a few sad tomatoes. The kids hate aubergines! 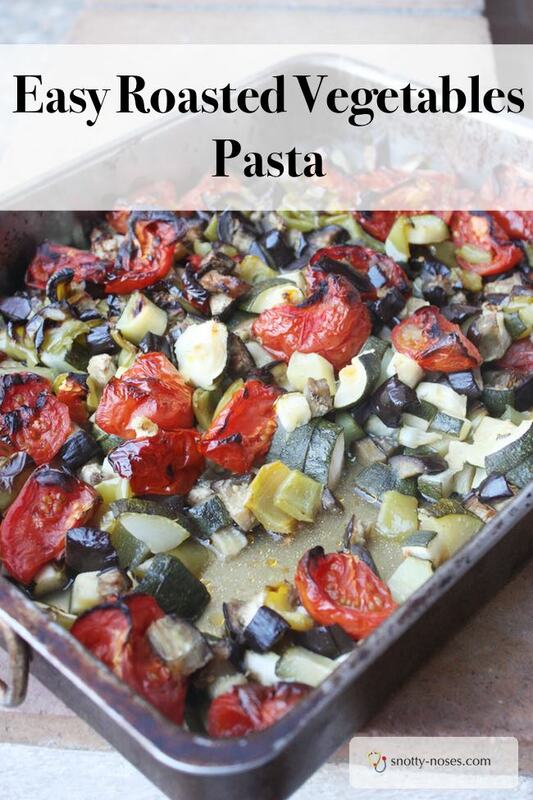 A flash of inspiration and I remember this awesome recipe for easy baked vegetable pasta. It’s a healthy dinner recipe AND quick, 10 mins to chop some veggies, chuck them in the oven and that’s it until I need to cook the pasta. Roasted Vegetables are so easy. I’ve served mine with pasta and made them into a ‘sauce’ but you can eat them by themselves or with baked potatoes. They’re really versatile and the ‘doing’ bit is really quick. They take a while in the oven, but you’re free to get on with that long list of things! This is what I’ve used but you can roast pretty much anything! basil, thyme, oregano are all great to throw in as well. Just make sure they’re covered in oil or tucked into a tomato so that they doesn’t burn. Chop up all the vegetables. Chuck in some olive oil. You want enough oil to prevent them from burning. I put the tomatoes on top so that they release their juices and help coat the other veggies. Cooking time an hour to an hour an a half depending on how deep you fill your tray. Mine took an hour and a half. Make sure you check it after half an hour and toss the vegetables around to stop them from burning. 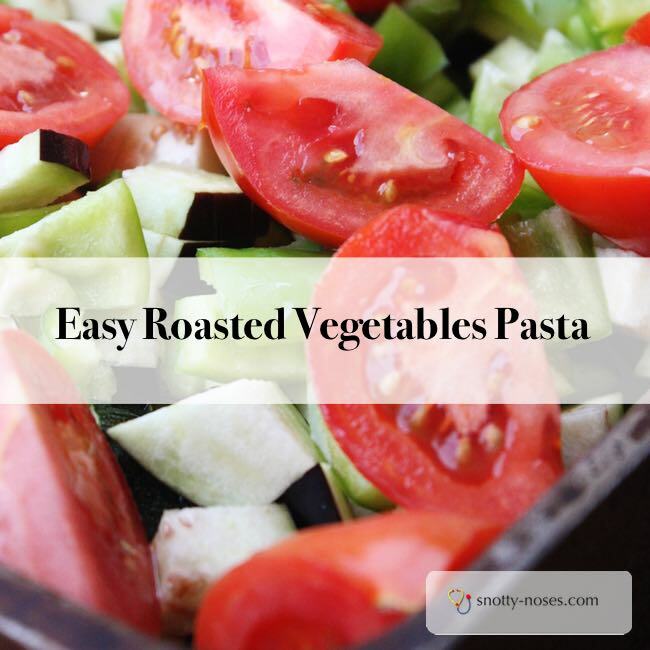 How to Make the Roasted Vegetable Pasta. Cook the pasta according to the packet. 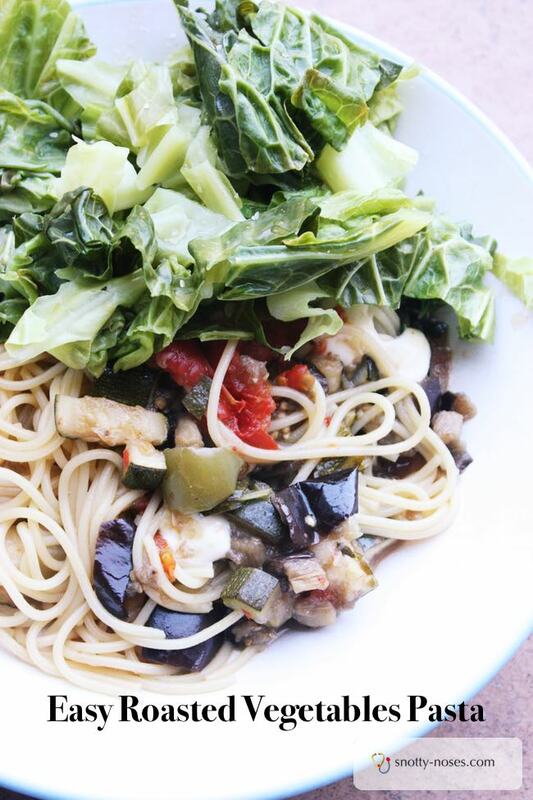 Mix up the vegetables, mozzarella and pasta. Well, I give it to them and tell them that they don’t have to eat what they don’t want to. Some of them pick out the bits of purple skin and that’s fine. They still have a tasty meal with lots of healthy vegetables in it.